This entry was posted on January 23, 2016 at 11:58 pm and is filed under politics, Systems Of Thought, Taxes, USA. You can follow any responses to this entry through the RSS 2.0 feed. You can leave a response, or trackback from your own site. It’s sort of superfluous of me to leave a comment since you said everything I believe so much better. But what it really comes down to in this election is a gaggle of people (gaggle as you know being a collection of geese) who want to be president – that would be the GOP Clown Car plus Hillary. And then there is this other socialist-communist-NY Jew-troublemaker Sanders who keeps talking about changing things (as you so very correctly point out) and principles and inequality and stuff (god!, he’s been nattering about this for 30 or 40 years. So boring.). I’m sure you also know what a pantomime is (as the British use the term) and what everybody wants in this election is a pantomime – a really good show. Not Sanders and this stuff about poor people and injustice. That’s not entertaining! Dear John: Your comments are never superfluous. Dear John, if Sanders would be Irish, would it be worth mentioning it? Or you would be satisfied by mentioning his other attributes? Although Americans tend to pay attention to people’s origins… Much more so if “”””Jewish”””… Something indeed 100,000% irrelevant in the case of Sanders. Nobody goes around paying lots of attention to Ted Cruz being …”Hispanic”… Although since he was born in Canada from a non-American father, some try to claim he was not “American born” (the noble law scholar had not just misread early 18C Common Law, but ignored it completely… Cruz is indeed “American Born”. Obama squandered his opportunities much to the frustration of his electorate. His golden moment came and went by midpoint of his first term. Weak ACA and Dodd Frank instead of re-instituting Glass Steagal and criminal prosecution of financiers. Still better than McCain -Palin or Romney-Ryan but disheartening nonetheless. The steady attack on the common working class is maddening yet the plutocrats have been successful in their divide and conquer strategies along race, ethnicity, “patriotism” “support the troops” propaganda. How long can it continue? Sanders has a track record (unlike Obama) and without the racial backlash he may be able to accomplish something. Big obstacle could be the Socialist label once GOP and Clinton attack dogs begin howling. Obama could have done everything in his first three months. But he was a baby. And pluto-demos (Pelosi, etc.) were firmly in control. They were the problem not the Republicans. 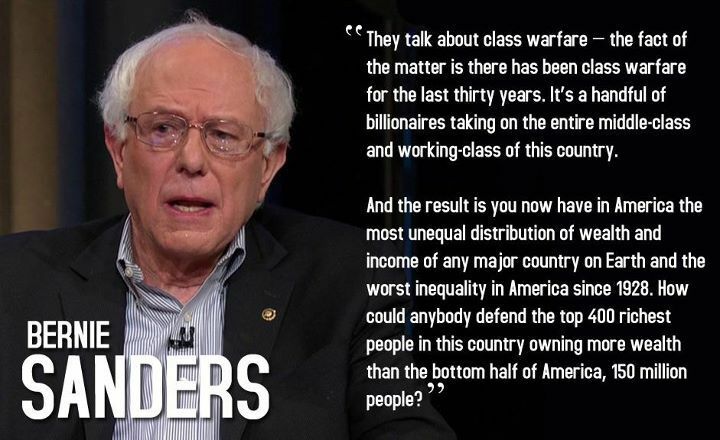 Sanders is seriously conservative in some ways (guns, defense). He has also a multi-decade track record. It’s not easy to brand him a socialist, but Clinton has already started. If I were a fairy and I had a magic wand, I would make him president, with Trump as VP (hahahahahaha). Seriously: those two agree on the two most important things, where plutocracy is the most hysterical! Obama was thwarted by his own hesitancy (he wanted to try bipartisanship no less), GOP and also Dems such as Pelosi. Under those circumstances, getting the ACA passed ( a plum for the health insurance industry) was no easy task and he capitulated on the public option. After that it was all down hill. No prosecutions of Wall Street corruption, no penalties, and failure to break up big banks. Banks are bigger now than ever. Sanders is the clear choice in the fight against plutocracy- Trump has fired some shots at plutocracy but what does he really want to accomplish? Given his position and interests, it seems unlikely he would pursue any reforms against plutocracy-inequality if elected. Certainly, Clinton and Trump will cry Socialist all the against Sanders if they believe it in their interest. Could Sanders’ continued popularity drive Clinton further left in her campaign or perhaps lead an opportunistic Trump to lean further against plutocrats to bolster his position? I live in New York and you’re right about those Dark Money towers. Ever so often there’s a newspaper article about the phenomenon of so many super-luxury apartments being vacant. But of course they’re intended to be a store of value (like a gold bar) and not an actual residence. A lot of the same thing in LA and Miami with estates and mansions. It’s a worldwide infection. Lots in Paris and London too (perhaps even more). Just one close relative of Syrian dictator Assad has more than 200 million Euros of known property, in France alone. The USA is the greatest tax haven in the world. Cracking down on Switzerland, Panama and the Caymans, has made it even more so. The American authorities know this, it’s the whole idea. The American authorities know that the USA is ever more of a tax haven for plutocrats, it’s the whole idea of the plutocratic empire: control power. Your essay seems to offer a subtext: that Trump has no chance of being nominated GOP candidate, and winning the presidency. Did you intend to convey that? In truth they are making anybody-but-Trump (or Sanders!) into paradise. All the powers that be don’t want Trump. They fear him, because, first he knows how banks work, and they don’t intimidate him… And so forth. So my position, more precisely, is that Trump (and Sanders) are the two guys whom the establishment fear and detest. It will do its best to avoid them. There is no Difference between “Left” and “Right” in the West today. Wealth destroys empathy. The ruling class has lost touch with the rest of the species. They think they don’t need us. A vote for Donald, for Hillary, for Jeb, for any other high net worth Establishment-approved candidate is a vote against the 99 Percent. It is a vote for continued servitude, if you are in the 99 Percent. Compared to Bill and Hillary Clinton’s combined net worth of $121 million, Bernie Sanders’ net worth of $528,014 is 230 times smaller. Compared to Bill Gates’ net worth of $80 billion, Bernie Sanders’ net worth is 151,515 times smaller. Finally, Jeb Bush has an estimated net worth of about $21 million. Through his Foundation, Bill Gates controls much more than 80 billion directly. It’s more like above 130 billions, slightly ahead of the two Koch brothers. The true wealthy HIDE THEIR WEALTH. So all the announced numbers are underestimates. I worked for a while as an attorney at a major NY bank cleaning up their records in a very large vault to get by a government audit. I was appalled at the sloppiness and disorder of the files (contracts, trust agreements, letters, etc.) which were supposed to support hundreds of millions in transactions. I suppose as long as the accounts balanced nobody could be bothered to do the paperwork right. Which was why they were worried about the audit. Anyway, what really astounded me was the inventiveness and creativity in the asset structures reflected in the files. Nothing that would occur to you right away to own, like office buildings or factories or yachts or whatever people think the super rich own. But rather remote tracts of forest land, obscure holding company agreements for items with imaginative names for things not otherwise identified, reciprocal contracts for god-knows-what and god-knows-where, etc. It was flabbergasting and eye opening. And this was in an American bank subject to some oversight. Offshore I can’t imagine what they get away with. This is indeed what DARK POOLS are all about: money completely hidden in complex structures. Sending the money to a chain of accounts help. The tax code is thousands of pages, always evolving dynamically, from year to year, precisely to serve the .1%. The only solution is a WORLD WIDE “CADASTRUM” (an inventory of all and any property). Taxation for surveillance and punishment of the 99.9% will not be enough. Actually, it will have the opposite effect, augment the plutocratic drive. Thanks for sharing that. It seems you have very interesting real-life tales to tell, John. Big money plutocrat Bloomberg is so incensed at SANDERS, he thinks about running as a third party candidate (that would get Trump or Cruz elected). Bloomberg has the same problem Trump and Cruz do – megalomania. It’s not a coincidence.